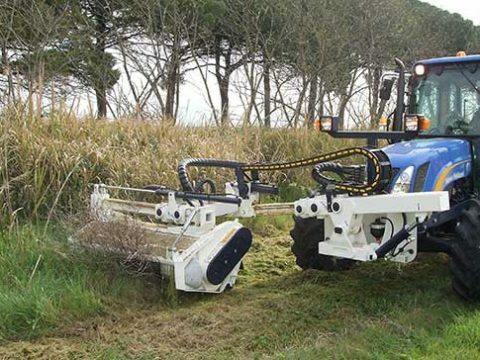 Bush cutters designed to be mounted on the front of the tractor, on the front hoist with a three-point hitch or via the coupling frame on the mounting plate, that operate via connection with the shaft drive to the PTO. 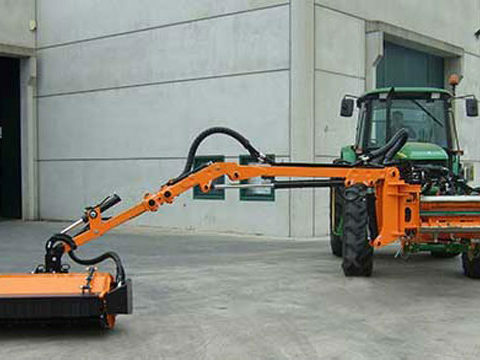 All of the machines, like other models such as the rear-mounted ones, can be installed on the front of tool-carrying vehicles such as trucks, loaders, backhoes or any other self-propelled vehicle that is suitable and, if they have the appropriate system, will operate directly with the vehicle’s service system. 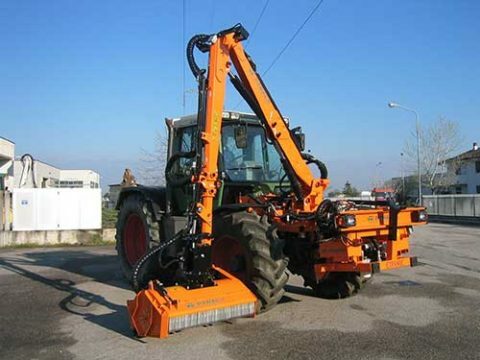 The various series in the catalogue differ in the construction of the arm, which is consistent with the length and the tools attached at the end. 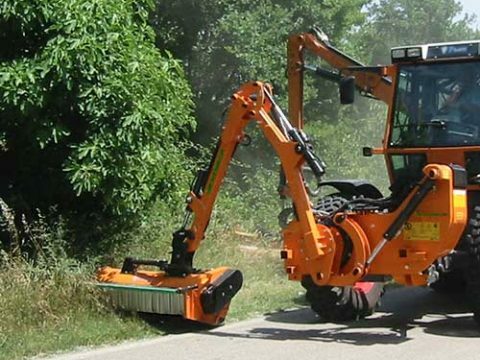 Our front-mounted bush cutters derive from the ones with long hydraulic arms with which we started our company, and have been built with the same ideals: sturdy, functional and efficient. The structures, designed to withstand the stresses during the lifecycle of the arm, are made out of high-strength steel. The fundamental elements of the joints, bushings and bolts are made out of steel that has undergone hardening and grinding treatment that increases its strength and optimises its functionality, thus lengthening its lifespan. 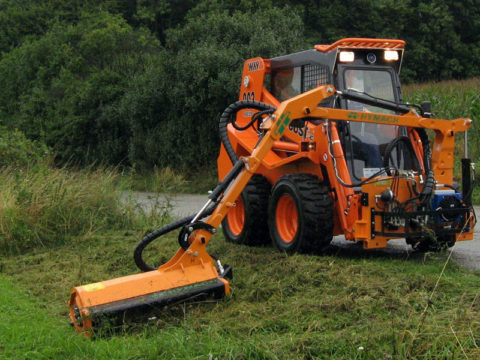 The jacks, equipped with control valves, guarantee excellent manoeuvrability. The main components of the operating system, such as the pumps and engine, multiplier, distributor, radiator, have been chosen from the best brands on the market for performance and reliability. 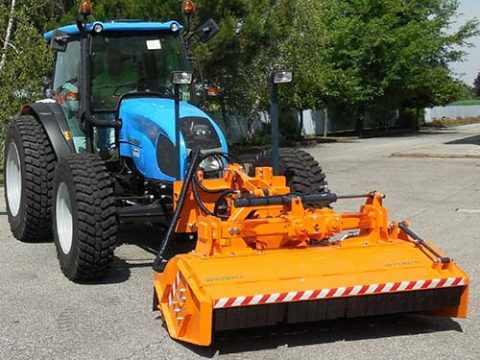 This ensures high performance in power and productivity. 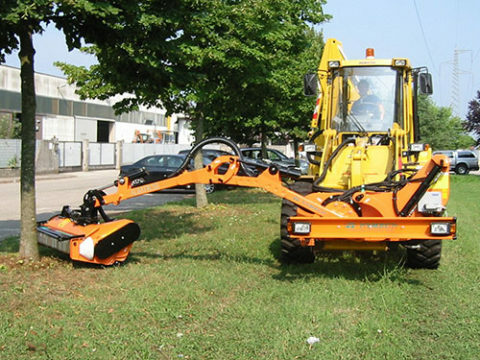 There is a variety of choice of cutting heads for the different types of vegetation and condition of the ground which guarantees the continuity and uniformity of cut. 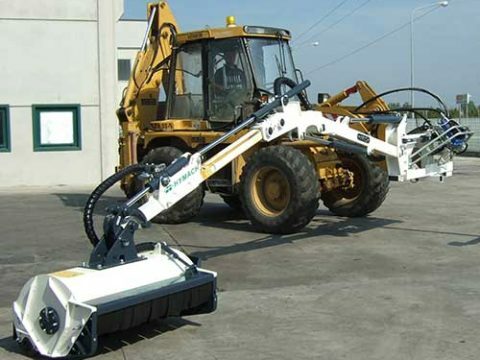 The possibility to interchange the cutting head with other tool heads with a few simple steps makes each machine versatile, and practical for different jobs. They can be custom built by modifying both the structure and the system for each user’s particular needs. Versions available both for right-hand and left-hand work. The skills acquired, our enthusiasm and our determination support us and give us the strength to fully live the company day after day and to develop the continuous process of business improvement making our values the company is founded on. Puoi cancellarti dalla newsletter in qualsiasi momento cliccando sul link riportato nelle comunicazioni che riceverai. Consulta la privacy sul nostro sito.